Bali craftsmen split rocks into small slivers of rock, connect them onto cement forms and create large plant vases, or whole walls. This is a plant holder. Not only are the rock slivers connected to each other and the cement (creating the vase), but every time I see it sitting in my living room, I’m reconnected to Bali. Cliche, I know. But I was in a hurry to post, and my only other option was a photo of a bridge, which I liked better…but really cliche, eh. As you might guess, this thing weighs a ton. I know. I loved the way it looked first time I saw one. Very labor intensive! 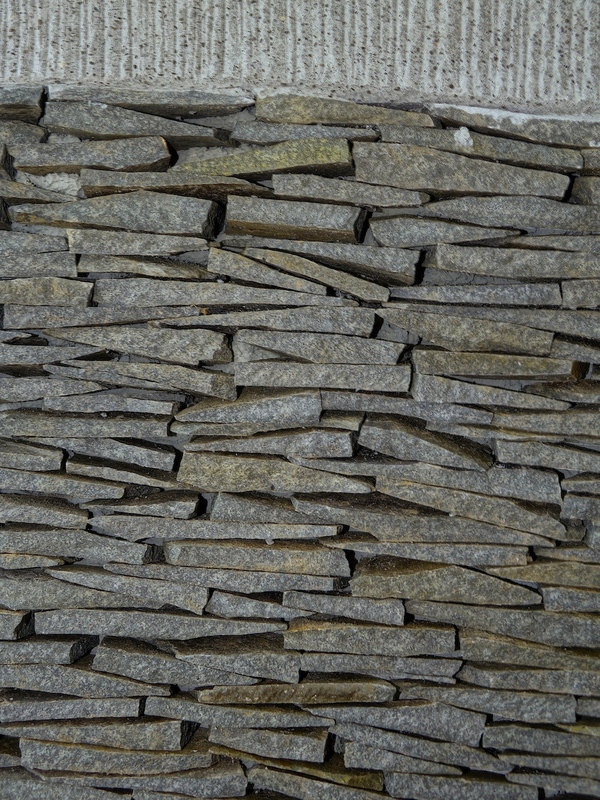 Love the texture of all that staggered stone! I liked the bridge photo better. But then thought…tomorrow is another day, another photo. It actually looks better in real life. Very cool, very…um…earthy. I never would have guessed a plant holder (looking at the photo first) It reminds me of those stone walls that I see all over the countryside, to separate parcels of land, and such. I’ve always loved those, with their mossy sides and such. What kind of plant do you have in it? I do have photos of it where you’d know it was not a wall. And others with the plant in it. I guess maybe I should have put a small photo of it in there with the plant in it. I didn’t think of that…maybe because it wasn’t about the “vase” so much as it was about “connection.” The plant is a 15-year-old rubber plant that has grown up and then bent itself sideways to catch the sun from the window–very odd plant. I had to prop up the limbs with bamboo posts because they were getting so long with no support in the horizontal position! If DP has a theme on “support,” I can use a photo of that plant! Connection, you say. I think that they both fit that description. Connection, as in how the slivers of rock fit together (which in itself is quite cool looking). But also connection, as in the pieces are trees in the forest, but there’s still the whole. That’s me being mischievous. Thanks…easy to capture, since it doesn’t move and it’s in my living room!